Oklahoma, population 3.9 million in 2015, has a lot to offer baby boomers or others who are looking for the best places to retire in Oklahoma - the Sooner state. It has a varied mix of terrains from lake districts (200 man-made lakes) to mountains like the scenic Ouachitas and Wichitas - in fact it is 1 of only 4 states to have more than 10 distinct geographical regions within its borders (it has 11). It has many interesting towns of all sizes, and a fairly mild winter climate. Oklahoma's cost of living is much lower than average. It has a rich native American culture and it is the headquarters of more American Indian tribes than any other state (there are 50 tribes in the state). The median age in the state is a relatively young 36.2.The Wikipedia entry for Oklahoma has more interesting facts. Updated Dec. 2016. The reviews on this site can help you narrow your choice about where to retire in Oklahoma or other states - we have important information about real estate prices; what makes each community special and not so special; along with important facts about the cultural, economic, medical, and transportation infrastructure. The Oklahoma climate is humid-sub tropical, strongly influenced by the Gulf of Mexico. Summers are hot and humid with frequent thunderstorms and occasional tornados. Winters are milder in the south. The panhandle region is semi-arid, the eastern part gets more rain and has many lakes. Oklahoma's 2010-14 household income at $46,235 was $7000 below the U.S. average. Oklahoma has the 4th lowest cost of living of any U.S. state. Median home prices are much less expensive than elsewhere in the U.S. - the Zillow Home Value Index in late 2016 was $113,000 vs. the national figure of $191,000. The median home in the Oklahoma City area sold for $154,800 in the third quarter of 2016 (NAR); whereas in Tulsa the median home went for $156,500. Tax Burden: At 8.6% of income the the total tax burden in Oklahoma is the 40th highest in the nation. Marginal Income Tax Rates. Oklahoma has an income tax with 6 brackets. The top bracket is 5% which starts at $12,200 for a couple. Retirement Income Exemptions. Any individual who is retired from any component of the Armed Forces may exclude the greater of $10,000 or 75% of their military pension. Individuals may exclude up to $10,000 of other retirement income. Oklahoma does not tax social security income. Sales Tax: State sales tax is 4.5%, which is below average. Property Taxes: Oklahoma has the 49th highest per capita property taxes at $515 per capita in 2013. Homestead Exemption. There is a homestead exemption which lessens the property's value by $1000. Seniors with limited incomes may be able to freeze the value of their home for tax purposes. Oklahoma does not have a certified retirement community program. Oklahoma has many towns that are great as a retirement location; it is also starting to have many planned retirement communities. One of the best places to retire in Oklahoma is Bartlesville, home of Frank Lloyd Wright's only hotel project and a surprising cultural capital. Other great retirement communities are near Oklahoma City, Tulsa, Stillwater, or Lawton. 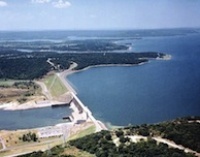 The eastern part of the state near Lake Eufaula and Ardmore is very popular because of the number of man-made lakes there. Norman is a livable town that enjoys the excitement of being host to the thriving University of Oklahoma. Oklahoma City is the capital city and Tulsa is the second largest city. At Topretirements.com our reason for being is to provide the practical facts and peer-reviewed profiles to help you choose the right retirement community. So if you are considering an Oklahoma retirement, check out the more than 200 listings on this site. Here is more inside information on retirement living communities in the neighboring states to help you retire in Louisiana, Arkansas, Texas, New Mexico, Missouri, Kansas, and Mississippi. These links provide insight and data into economic conditions, climate, top communities, and taxes.